The best way to prepare for life after college is to get hands-on experience. That’s the philosophy of a UT class working with the Toledo Museum of Art. Featuring numerous print pieces depicting cities — grand views from famous boulevards to glimpses of anonymous corners — the Toledo Museum of Art’s exhibition “The City” is filled with unique prints of bustling metropolises. What’s more, the exhibition was curated by the UT Art Museum Practices class. 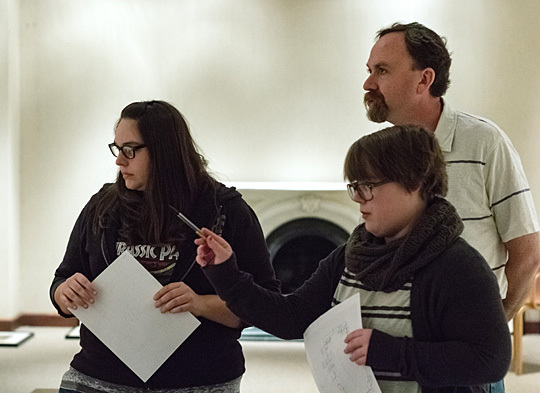 Crystal Hand, left, and Alyx Smith, both students in the Art Museum Practices class, and Dr. Thor Mednick, assistant professor of art history, checked out the Toledo Museum of Art Hitchcock Gallery. 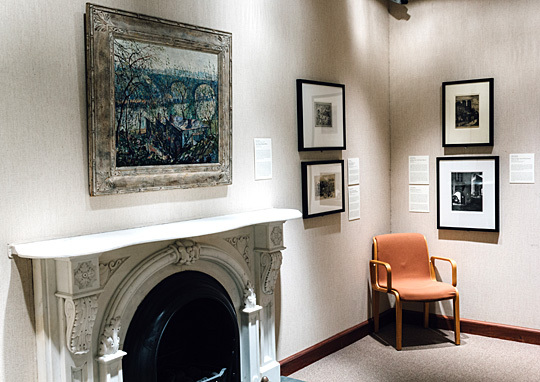 Students were responsible for creating the themes for the exhibit and choosing relevant work to display from the museum’s permanent collection of prints, in collaboration with staff members from the museum. They then wrote labels for the works, and the copy was reviewed by the museum’s managing editor. Finally, they planned the sequence of the pieces in the gallery. Working with the Art Museum Practices class was a New Media Design Practices course, which was responsible for creating exhibition graphics for print and web interfaces. 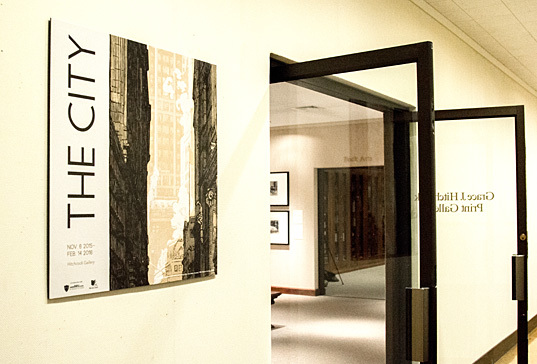 “The City” was curated by students in the UT Art Museum Practices class, with assistance from their peers in a New Media Design Practices course. The exhibition implementation course is the third in a series of four classes that comprise the art museum practices concentration, a self-selected area of study for students who want a career in an art museum. Throughout the series, students have the opportunity to meet museum professionals and learn the various responsibilities of a museum worker. “Rather than a primarily theoretical or speculative approach, we attempt to prepare the students for the actual working life of a museum professional,” said Dr. Thor Mednick, assistant professor of art history, who taught the Art Museum Practices course. The free, public exhibition is on display in the Toledo Museum of Art Hitchcock Gallery through Sunday, Feb. 14. In association with the exhibit, the films “Chinatown” and “Blade Runner” will be featured in the Toledo Museum of Art Little Theater in January. Students will introduce the films and discuss their relationship to the city theme. For more information, visit toledomuseum.org/exhibitions/the-city. This entry was posted on Friday, January 29th, 2016 at 3:31 am and is filed under Arts, Events, UToday, — Communication and the Arts .